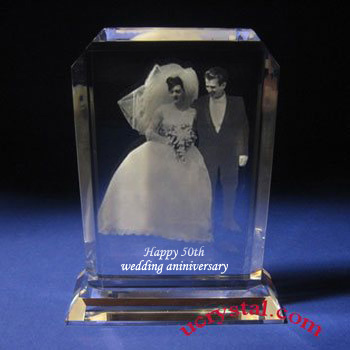 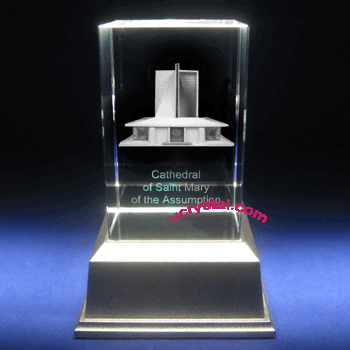 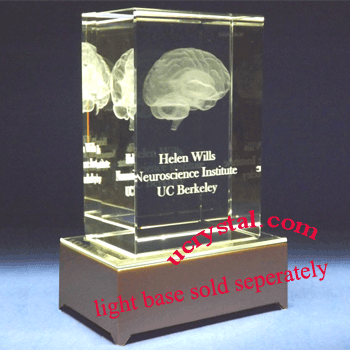 Welcome to our online store for 2D and 3D laser photo crystal engraving. 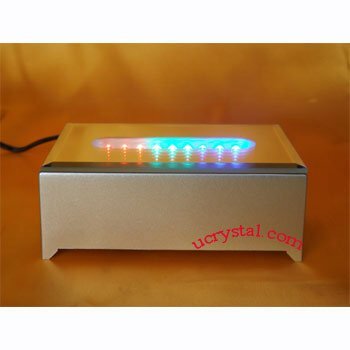 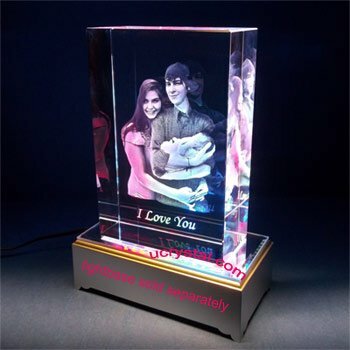 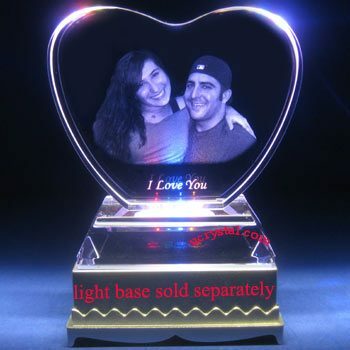 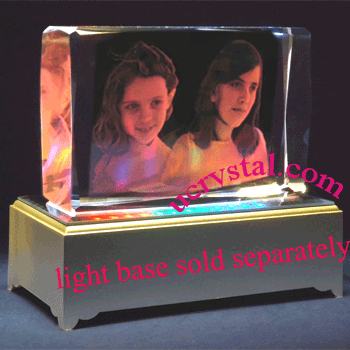 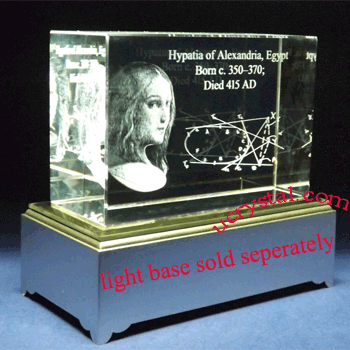 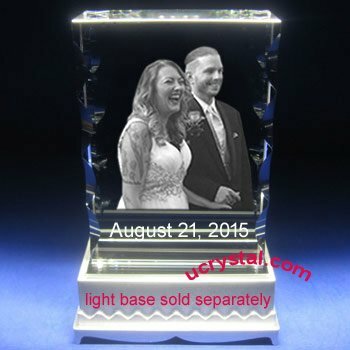 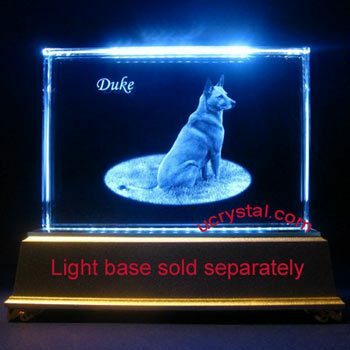 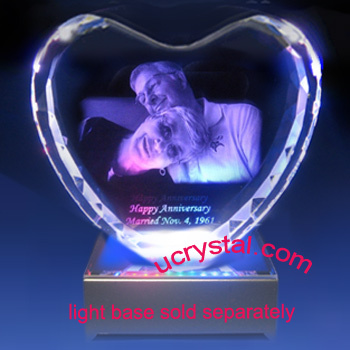 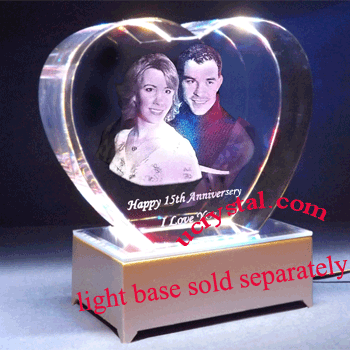 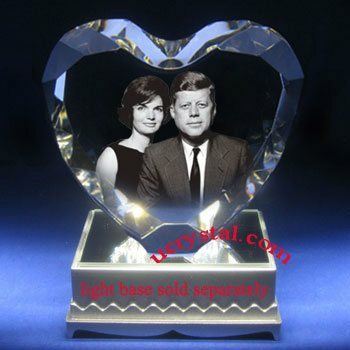 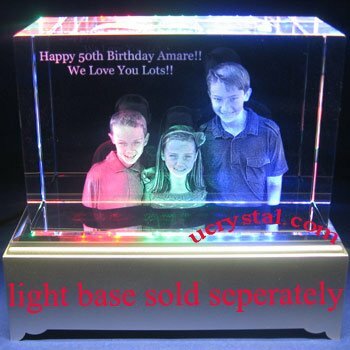 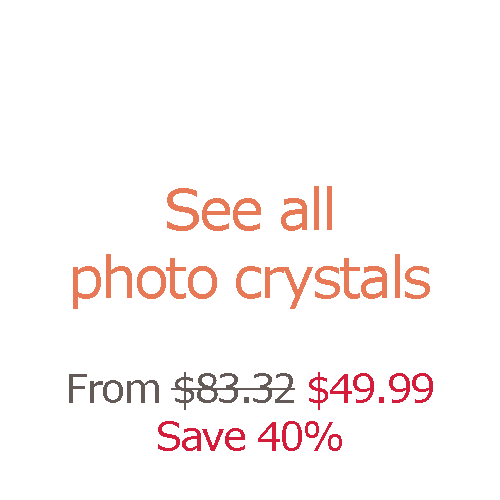 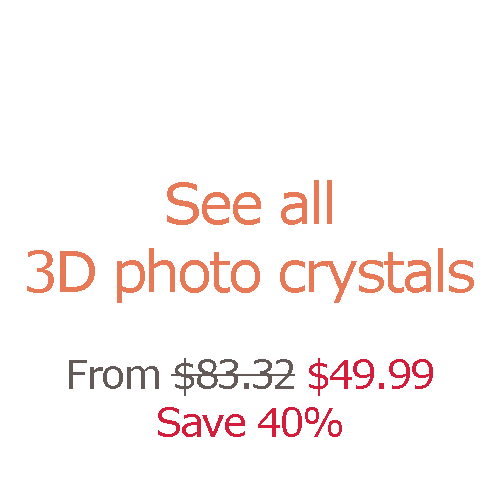 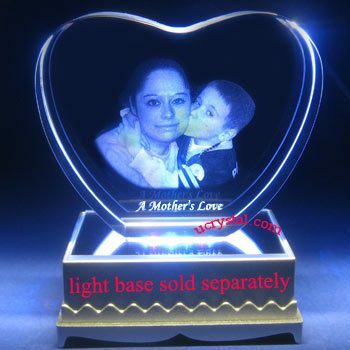 Here you will not only find a large selection of finely crafted 2D and 3D crystals for personalized photo crystal gifts, you will also be able to see many suitable LED light bases to enhance your engraved crystals and crystal arts. 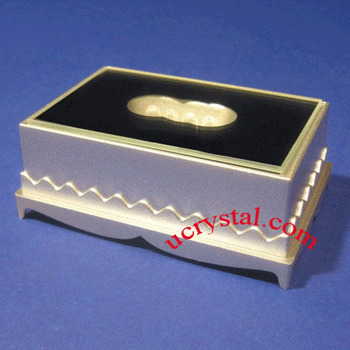 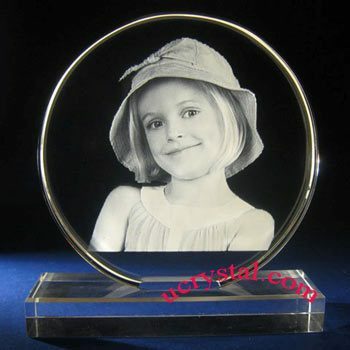 Two important aspects need to be considered when you select the photo crystals for your special engraving needs. 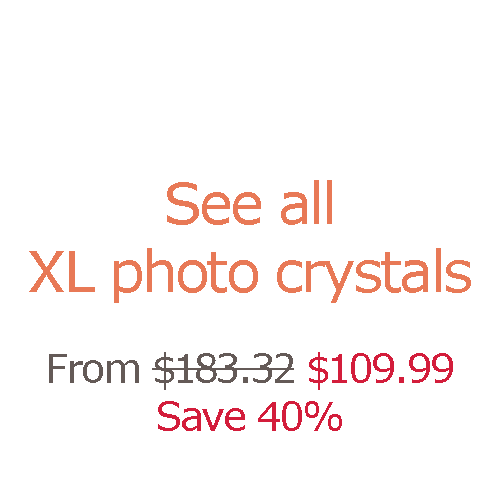 The first is the thickness of the photo crystal. 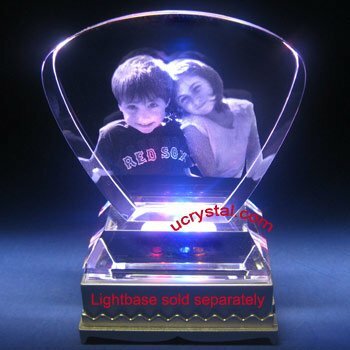 Thicker photo crystals will be needed if your laser engraving is 3D. 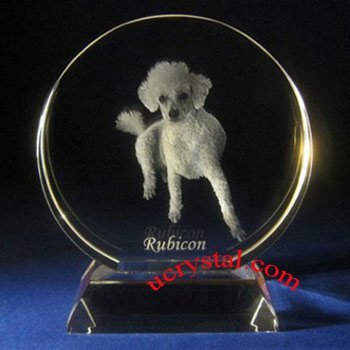 The videos displayed on our home page will help you understand the difference between 3D laser crystal engraving and 2D laser crystal engraving. 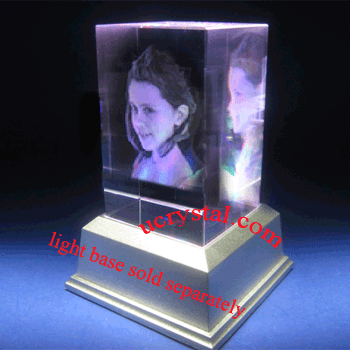 In another word, all laser crystals can be used for 2D photo crystal engraving, but only thicker crystals have the depth (thickness) to meet the needs of 3D photo crystal engraving. 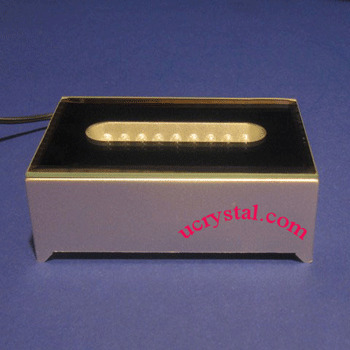 The second aspect of selecting suitable 2D or 3D crystals is the shape of the laser crystals. 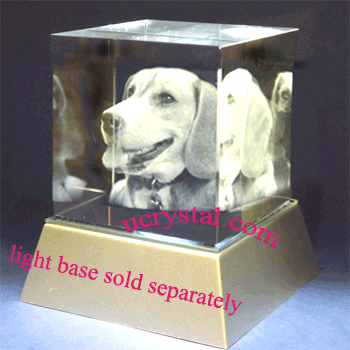 Depending on the applications, photo crystal shapes can deliver your communication in a subtle way. 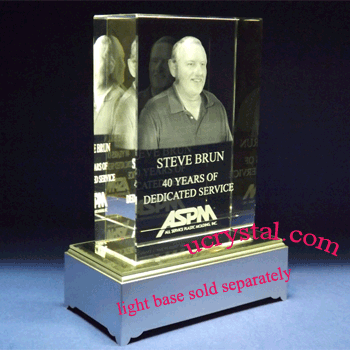 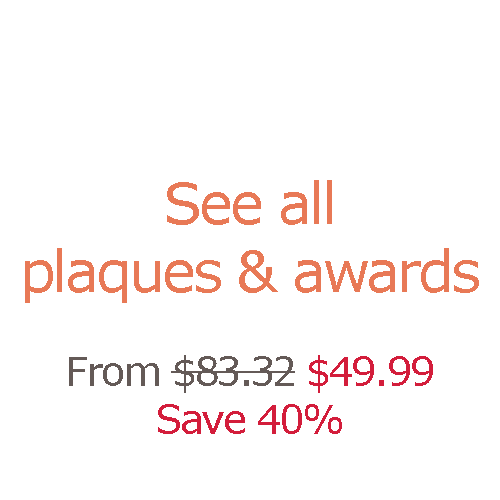 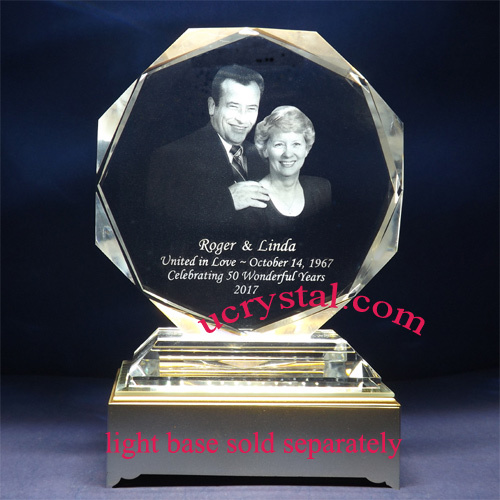 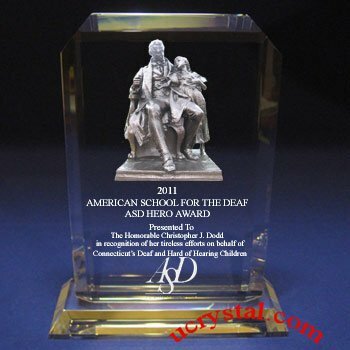 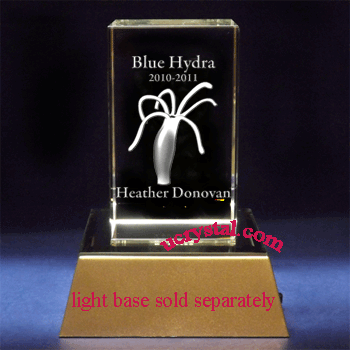 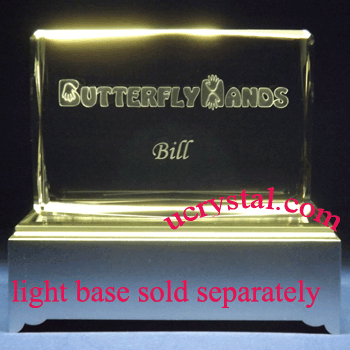 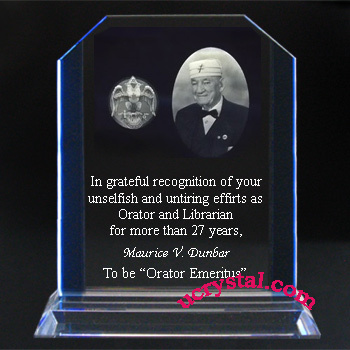 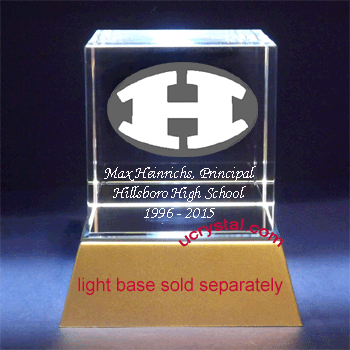 If you want to make the custom engraved crystal plaques for your valued customers or treasured employees, simpler shapes such as rectangular, round, or dome laser crystals are better at augmenting the venerated message. 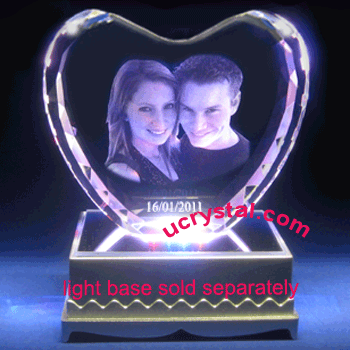 Heart-shapes photo crystals, on the other hand, are meant to show your love and affections. 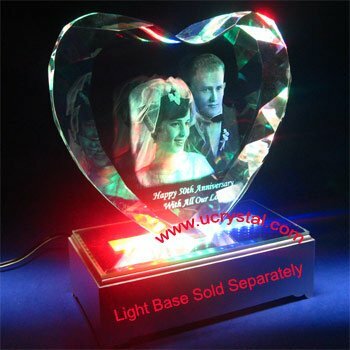 If the crystal awards are for people in the medical fields, or security professions, why not choose the shield laser crystals? 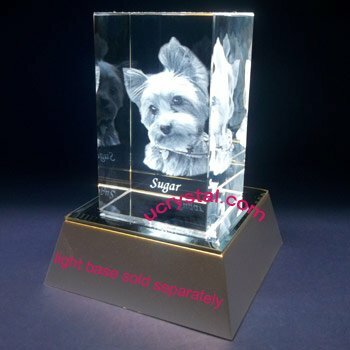 A perfect personalized laser etched crystal gift should fuse the image/logo, text, and crystal shape seamlessly together to reflect your thoughtfulness. 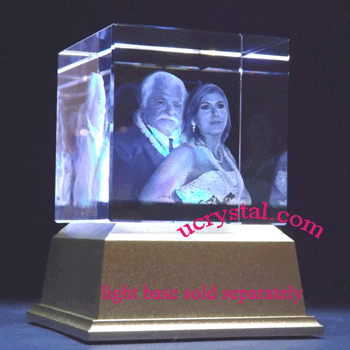 Like all forms of artwork, lighting condition greatly enhances the display results of the laser crystal engraving. 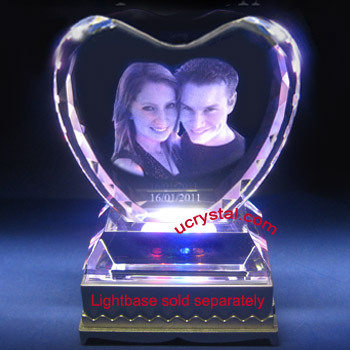 We have many LED light stands and rotary light stands for 2D and 3D photo engraved crystals and crystal glass arts. 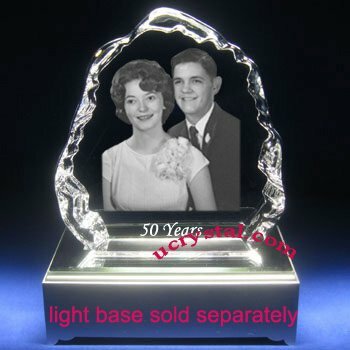 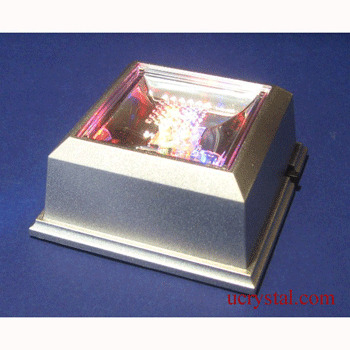 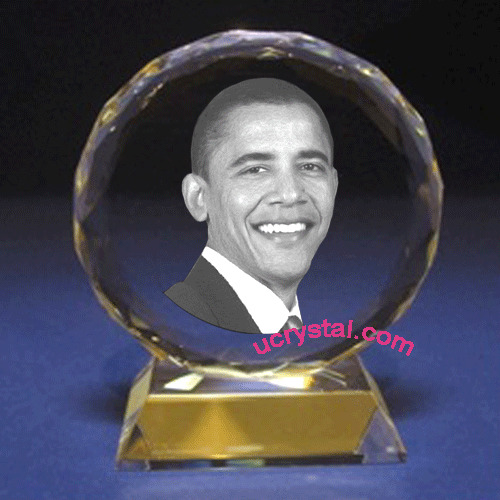 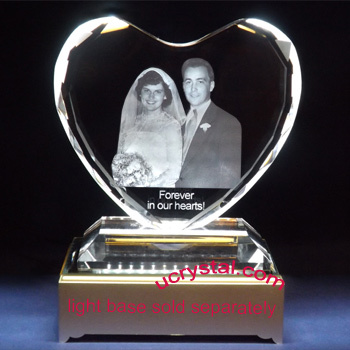 We highly recommend them for your photo engraved crystals or crystal figurine displays. 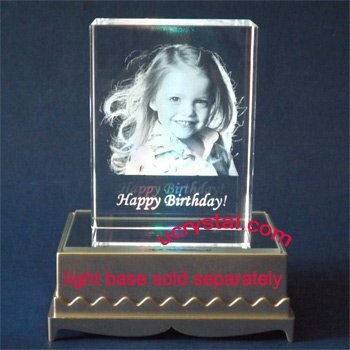 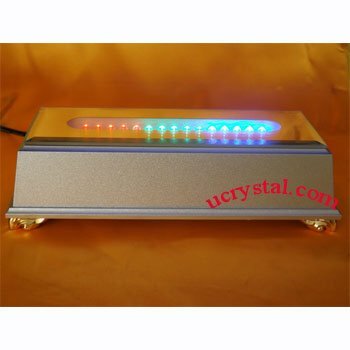 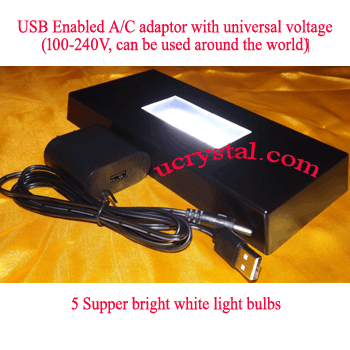 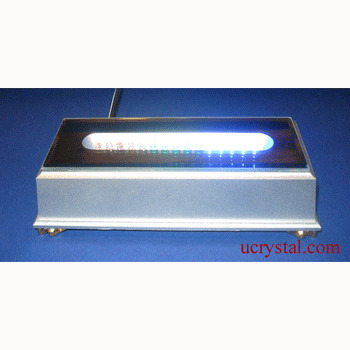 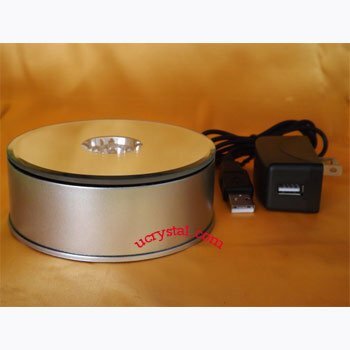 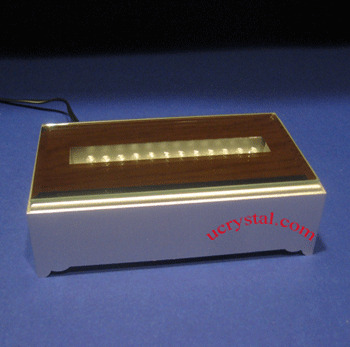 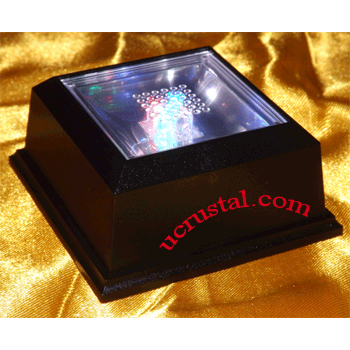 On each crystal page, suitable LED light stands are listed. 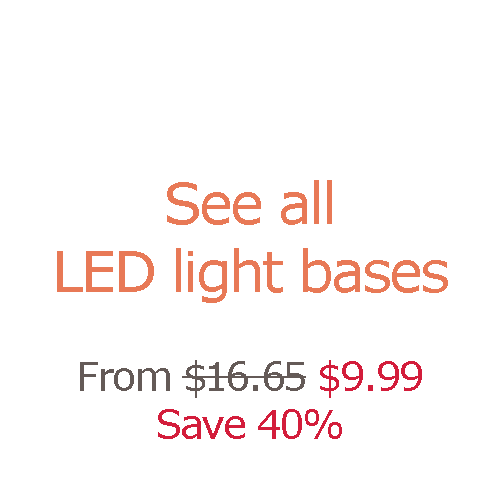 They either emit stable white lights or multicolor lights. 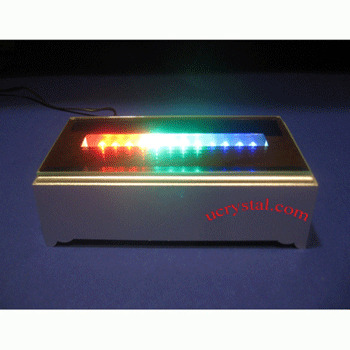 In case of multicolor LED light stands, different color lights tend to change intensity from one color to the next. 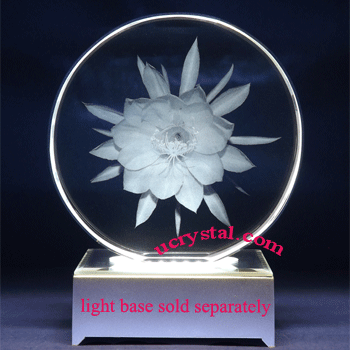 Please see individual light stands for technical details.